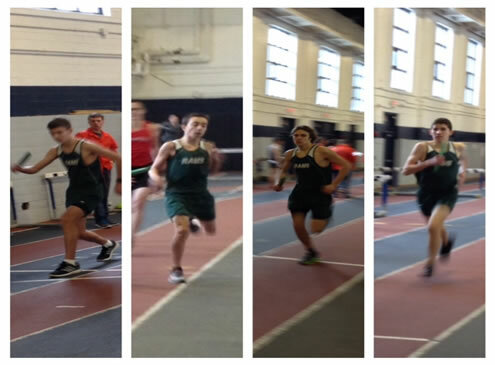 On Wednesday, January 27th the Raymond Boys and Girls Indoor Track Team competed at the Milford Dome. Gavin Call came up just shy of qualifying for the next to last meet, the “Open Meet” at UNH, with a time of 1:39.0 in the 600m. Also just missing qualifying was Colton Corriveau with a time of 42.3 in the 300m. Jacob Riley, Garrity Sargent, Cache Furmanick, and Kristjan Fraser ran the 4x800m in 9:45.1. Anna Harmon placed 2ndin the 300m with a time 44.6. At the end of the week on Sunday, January 31st the Track Team competed at UNH in the final meet before the State Meet at Dartmouth on February 7th. Jacob Riley, Gavin Call, Garrity Sargent, and Cache Furmanick competed in the 4 x 800m run, improving the team’s time to 9:43.3. Anna Harmon placed 1st in the 1000m with a time of 3:04.9, breaking her prior school record. She has met the automatic qualifying times for the State Meet in 3 events. Colton Corriveau and Gavin Call are scheduled to compete in individual events on Wednesday at the Milford Dome in an effort to meet the qualifying marks for the Open Meet next weekend. Jacob Riley, Kristjan Fraser, and juniors Garrity Sargent and Cache Furmanick will compete in the 4x800 relay, also in an effort to qualify for the State Meet. Anna Harmon also will compete at the Dome meet, but already has qualified for the Open Meet. Anna Harmon also has qualified for the State Meet in 3 events, and has met the provisional qualifying marks in 2 other events, ranging from 55m to 1500m.